Now that the ice is off the local waters we are all thinking about wetting lines again. In between the late winter/spring storms, there just might be some favorable windows of decent weather that will allow us to get out and fish again soon. It has been a rather wet winter here in Central Nevada and the ponds, streams and reservoirs are filling up again! This is great news and more water helps our naturally reproducing fish a bunch. It may, however, take several years for the fish populations to recover from the effects of our multi-year drought. No one knows if the drought is over. The rising water levels and increased flows will help the put-and-take stocked fisheries too; by moderating the water temperatures over the hot Nevada summer season. Let’s think about what we need to do in the coming months. Flyfishing and fishing in general is a wonder sport. It gets you out into the wide open spaces, on the water and can be satisfying in many ways. You might choose to fish with family and friends. Some prefer the solitude of solo angling. You can put food on the table and/or mark your achievements by catch and release fishing too. Counting the number of fish caught, and measuring the size of the fish we land can be a rewarding competition among fishing friends and family. As responsible sportsmen we are bound by the laws and regulations of the Nevada Department of Wildlife (NDOW). It’s time to get your 2016-2017 license and re-read the regulations. Buy the trout stamp and consider a second rod stamp. Note: June 11, 2016 is Nevada’s free fishing day. How will you approach the sport this year – keep them for the table or let them go free? 1) Keeping fish: There is nothing wrong with taking a limit of trout for the table. You are responsible to keep your catch from spoiling. The very best way to insure non-spoilage is to dispatch the fish immediately and ice them down. Fish spoil quickly hanging on a stringer. If you intend to keep a limit-then take a separate ice chest just for the purpose of keeping your fish fresh. Gutting your catch and storing these fish on ice will make those meals memorable. Try not to let the fish sit in the ice slush. Instead-drain off the water from the melting ice often in order to keep the fish cold on top of the ice. Follow the laws on take and possession limits, carry out your trash and be familiar with the laws and regulations on the specific water that you are fishing. The harvest limits vary by species and waters. Be responsible-and please teach your children well. 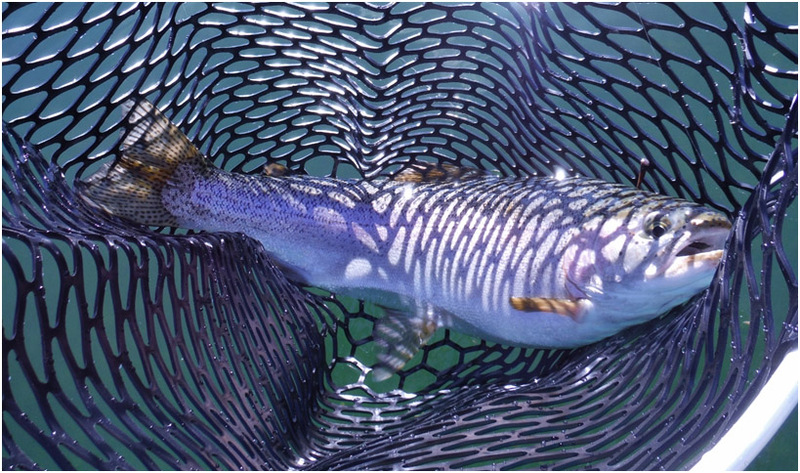 2) Catch and Release: Many flyfishers elect to Catch & Release. Many feel that this practice is the only way to go; since they are not harming nor taking the fish from the fishery. However, considering the varied studies on the topic, C & R anglers kill between 5-20% of the fish they catch and release! Many of them don’t realize this. So who is impacting the fishery more; an angler who takes a limit of 5 fish and then goes home, or the trout bum who C&R’s 50 fish in a long day-unwittingly killing five fish through post catch and release mortality? It becomes a push doesn’t it? Fishing is a blood sport and there is no way around that. If you want to catch and release, then it is your responsibility to do all you can to ensure the likelihood of the fish surviving the ordeal of being caught. Also-if you injure a fish-you should keep it for the table. 1) Minimize angling duration (the time a fish is played and handled before hook removal). Although we have all done it, don’t play a fish until it is exhausted. That is a sure way to kill it. An exhausted fish will take 4 hours to recover or it might just die after a battle. See how fast you can land and release your fish. It becomes a win-win situation. 2) Minimize air exposure (15-20 sec) by removing hooks with the fish in water and photographing fish quickly. A fish kept out of the water for even 30-60 seconds may be adversely affected and die. Even if it swims away, that fish may die afterwards if it has been mishandled. Air time kills fish. It is best to use forceps to remove the hook while the fish stays in the water. Respect the fish as it is a living creature. Don’t take pictures of the fish held at arm’s length to make it look bigger. It is a phony practice in my opinion. If you need a “grip and grin” photo-then take the time to pose that image of the fish in the water or in a rubber net. If you must have the photo, then time the shot so the photographer snaps the photo as you lift the fish from the water and then instantly dunk it. You’ll know when you’ve done this correctly when the picture shows the water dripping from the fish. 3) Use barbless hooks and artificial lures/flies. Using barbless hooks, or hooks with mini-barbs allows you to unhook the fish faster and to minimize the damage to the mouth of the fish. It is easy and fast to pinch down the barb of a hook using hemostats or flat billed fishing pliers. Better yet-do this at home before you set out to your fishing hole. 4) Use rubber nets void of knots that protect fish scales and mucous. Keep your hands off the fish if possible. Hoisting the fish vertically to snap a picture is a sure way to injure the fish. In a vertical position a fish’s organs are unsupported and can get damaged just by the force of gravity. Therefore, keep the fish on its side-netted or not-and quickly get that hook removed. The object is to minimize stress and have the fish swimming again as quickly as possible. 5) Avoid angling during extremes in water temperature. When the late summer temps hit 100F and water temps approach 70+ degrees, it is time to sit by the swamp cooler and watch your favorite fishing shows on TV and tie flies. Give the fish a break until fall. Fish, especially Trout get super stressed trying to survive in warm water. Signs of stress include a change to a dull color and lack of fight. These stressed fish won’t taste good or provide much sport and likely not survive catch and release.